How many pro-life advocates can say they have ever had a single conversation with a pro-choice person that went well? How many can say that they have seen someone change their mind on abortion because of a conversation that they had with them? I think if people got a taste for this type of activism, they would never want to look back. When you witness someone change their mind on abortion, it changes you. [Tweet that] I have watched people go through that critical moment when it all comes together and the pieces finally click. On one hand it is exhilarating because you think to yourself “Yes! She finally gets it!” but on the other hand it can be an incredibly painful experience for them. One time my heart sank on campus as the girl I was speaking with looked me in the eyes and said, “This isn’t okay. This really is killing a baby, isn’t it?” As she looked at me, realizing what she had been defending a few moments earlier in the conversation I could see how disgusted and sad she was about abortion, but also with herself. There was some combination of shock and disbelief in her eyes that I have seen happen many times since. There is something incredible about witnessing that sort of change in perspective on the abortion issue. Think about the passion that a conversion experience like that creates. 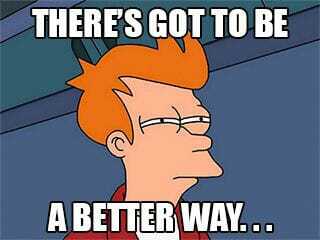 People who are pro-life that used to be pro-choice are not apathetic and silent. They are some of the most devoted pro-life advocates that you will meet, and many of them would never have changed their minds if a patient pro-life person hadn’t bothered to try. I’ve also worked with advocates who want to put an end to abrasive and smug Twitter-type activism. They don’t just want to preach to the choir and go to protests. They want something better. However, they are so turned off by the negative approach that they try to overcorrect and don’t want to tell pro-choice people why they are wrong. They may go on the March for Life, donate money to pro-life organizations and even wear a pro-life t-shirt, but refuse to have an honest conversation with their pro-choice roommate. In an effort to be as fair as possible to those who think that my balanced approach is too idealistic or unneeded, I want to interact with what I have seen to be one of the most articulate cases for the strong arm pro-life approach. I have a friend I’ll call “Max,” who both advocates for and lives by this type of activism. I’ll give some background, attempt to charitably present his case, and then respond. Max is passionately pro-life and otherwise politically involved. He is one of those people who starts debates on Facebook, and they always start the same way. He will pose a question to his Facebook friends, usually sharing an article of some sort along with his thoughts. His style is much more direct and argumentative than mine. People argue back and forth with him for a while on topic but often get so frustrated that they eventually comment something that completely derails the conversation. Max’s friends get angry, gang up on him, accuse him of not caring about people, and try to discourage him from starting posts like this in the future. Max and I have talked about his Facebook debating before and about abortion dialogue in general. He knows about my work with ERI, my dialogue experience, and my style. We also have a really strong friendship, a great deal of trust, and the ability to disagree strongly, but we still come out of it with respect for each other. The other night we argued again about his approach on Facebook because this time his post about abortion hadn’t gone anywhere productive and other friends were sending him private messages about how angry he came across. He feels like people who comment on his Facebook posts are so closed-minded on this issue that no matter what he says or does they won’t change their mind. He argues that the people who actually comment on Facebook posts are the types of people who already have strong beliefs about various topics and are there to push their view(s), not actually engage other ideas in good faith. I’ve heard some people in the apologetics world label this kind of solidified stance “foreclosure” for a specific issue, rather than open-mindedness. Because of this, Max says his goal in talking with the people in foreclosure is to create cognitive dissonance for the bystanders who are not participating in the debate but who are watching the public dialogue, and he thinks his more direct, snarky, or cutting responses are not counter-productive towards that goal. He says his goal is to inject ideas into the public square so that people must encounter them, and if they reject the ideas, then they are culpable; in so doing, he feels he has given them the opportunity to accept the truth (placed a stone in their boot, so to speak) and has placed the onus on them to embrace it or not. He emphasized to me that he thinks what matters is getting the ideas out there in a way that clearly shows his position is superior, and his way of delivering the ideas doesn’t matter very much given his priorities and audience. In his words, he shouldn’t have to “police his tone” because people are not going to change their minds anyway. In his mind, even if he is “turning some people off,” such an outcome is justified if he can make them think. His goal isn’t to change their minds; it is to make them uncomfortable. I think my friend is ultimately failing as a pro-life advocate online in three ways. Second, he is giving bystanders a lame excuse not to become pro-life because they see him acting poorly and, as a result, they feel more justified in dismissing his position. Of course, objecting to becoming pro-life because pro-life people are jerks is super unreasonable, but it is undeniable that the behavior of advocates affects many people on a subconscious level. Pro-life advocates have a responsibility to bring others to their position by presenting themselves and their arguments in the best way possible, and that means eliminating the lame excuses as well as defeating opposing arguments and collaborating on practical solutions. Additionally, if you make a really bad impression you’ve now colored their future interactions with the pro-life movement and through that made it more difficult for them to change their mind. Third, I think that he is aiming for a lower goal than he should be. He should be trying to help people become pro-life, not just throwing truth at them and hoping it sticks. Creating cognitive dissonance is a great intermediate goal, but it should not be our ultimate one. There is more that is needed to help people cross the conversion threshold. People need to work through a series of intellectual and emotional obstacles. It is certainly more difficult and time-consuming to walk with someone through that journey, but with something like abortion the stakes are high enough that we have a responsibility to reach for it. Max argues that at least he made them angry and made them think. 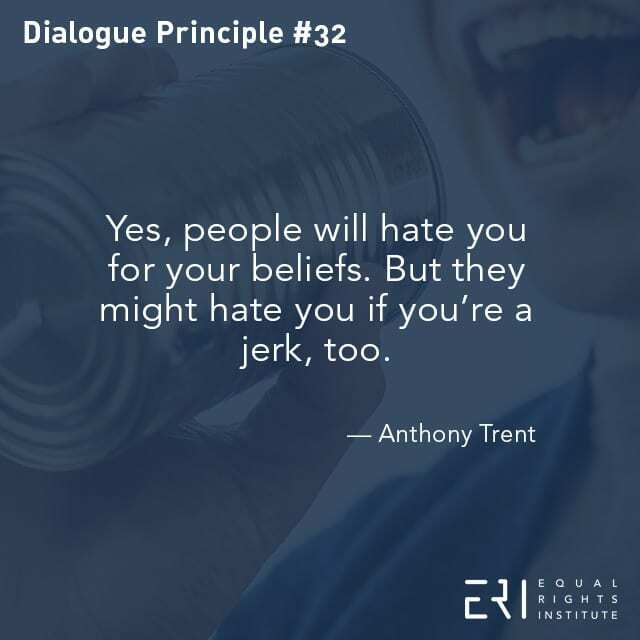 This reminds me of when people say, “If people hate what you’re doing then you must be doing something right.” This assertion can lead into a very dangerous rationalization territory. How angry someone is after your conversation is not indicative of how well you’ve made your case. [Tweet that] You don’t need to be hated to be effective, and just because you made someone angry it doesn’t mean you made a difference. 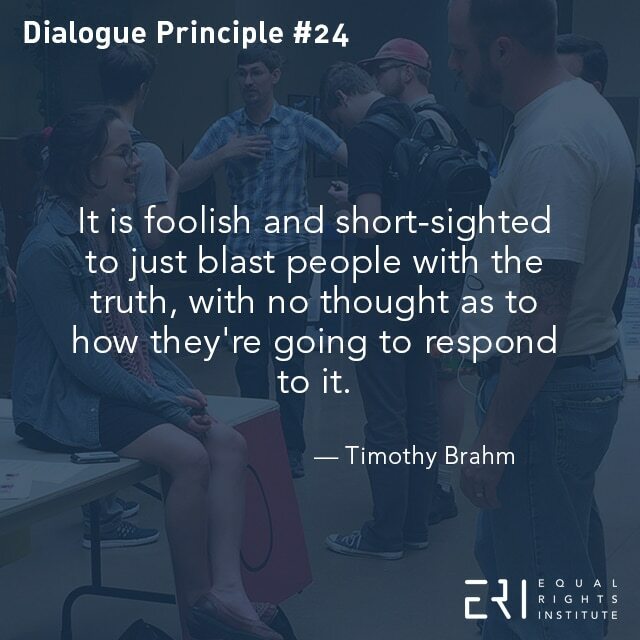 Leaving the conversation with a positive emotional experience is not mutually exclusive with having successfully shared the truth about abortion. I think it is short-sighted to assume that you have to choose between the two, and this mistake is stunting the potential of pro-life/pro-choice interactions. But it goes beyond a lack of vision. Mastering the art of navigating the emotional abortion landmines while simultaneously trying to respond respectfully to the other person’s arguments takes a tremendous amount of patience. It is incredibly difficult to be the pro-life advocate who sits there and listens carefully to a pro-choice friend explain why they think it should be legal to kill unborn children. Sometimes it makes you want to pull your hair out trying to imagine how someone would want to justify what feels like something that is so obviously wrong. 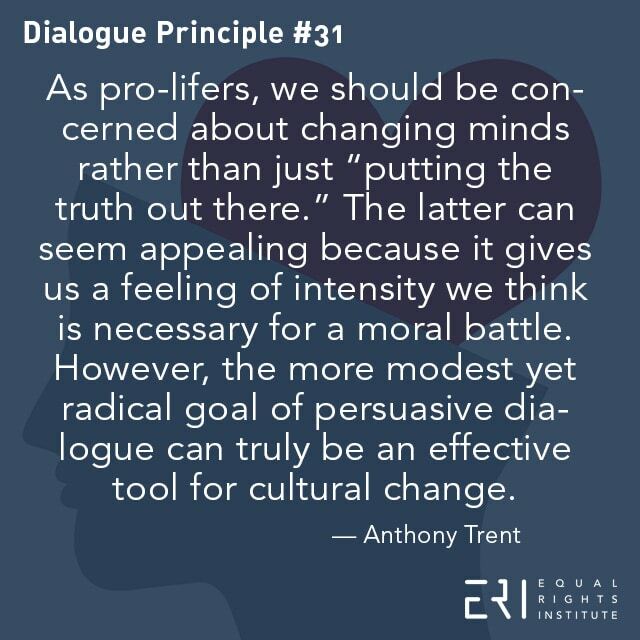 But just as the meek, introverted pro-life advocate needs to find the courage to speak up, so too should the frustrated, strident pro-lifer find the patience to listen and moderate her response. when we talk about abortion. We need to strive for the balanced approach: sharing the truth clearly and doing so winsomely. If people become angry with you during a conversation about abortion, it may be because they hate the truth and they are mad at you for speaking or sharing it. 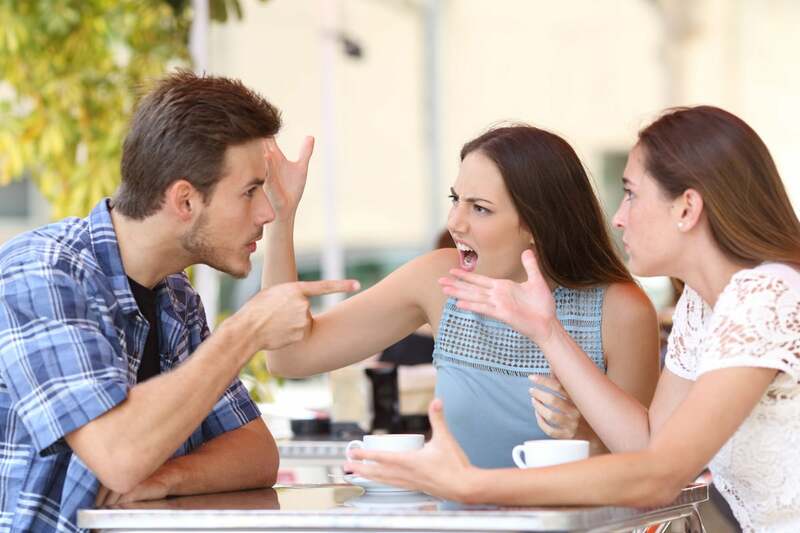 But if you dismiss every conversation that ends badly with the rationale that it must be them, and it is inevitable, then you will miss the opportunity to grow and fail to take responsibility for any bad behavior or mistakes on your part. You shouldn’t automatically assume that you made a mistake if they get mad, but you also shouldn’t automatically assume you did not make a mistake. Tweet: Mastering the art of pro-life advocacy requires a delicate balance of candor and affability. Tweet: When you witness someone change their mind on abortion, it changes you. Tweet: How angry someone is after your conversation is not indicative of how well you’ve made your case.